While working on the new edition of the Heavy Gear Blitz rules, we realized that Caprice needed a small low cost trooper mount to counter opposing factions. So the Acco was designed around the idea of having a Mount about the same size as a Gear with light weapons. The cockpit area in the front of the mount is just a bit smaller than a Hunters, with hatch for the pilot enter at the top. Behind the pilot is the iconic dome covering, on all Caprice Mount engines, and there are hard points on each side to attach the weapons systems. The standard Acco has a medium machine gun in the front, light rocket pack on the left, and light autocannon on the right. It will also have two variants; one with a light frag cannon and the other with a light flamer. 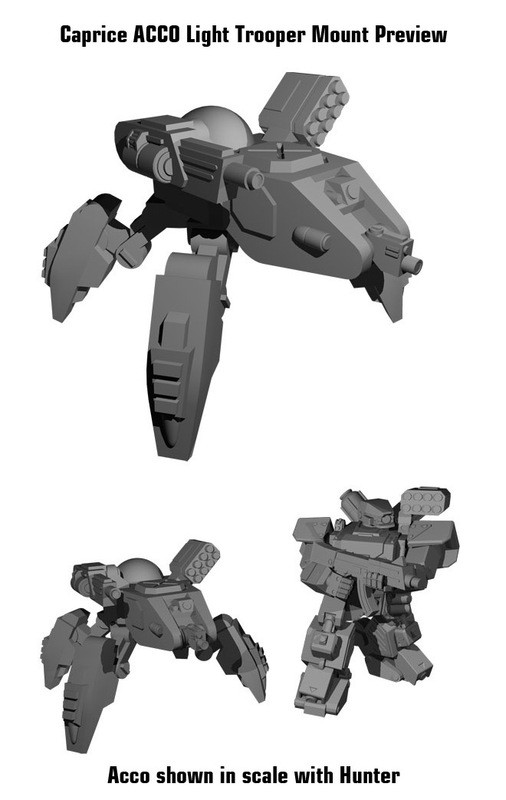 We hope you all like the preview image below with Acco at the top and then a smaller image of the Acco and a Hunter shown to scale, side by side. The Acco Mount will be unlocked when we reach stretch goal 12 at $99K in Pledges. At that point 4 of them will be added to the Core Starter Set, making it an even more amazing backer reward. Help us get the word out and share this preview wherever you can. We need everyone's support to make it a reality.